Coach Randolph Love was born in Dodge City, Kansas. He grew up in Aurora, CO playing most of his youth days with Colorado Storm. He won three consecutive State Cup Championships under Tony McCall and David Morgan. He also played for Rangeview High School and was the team captain his junior and senior seasons. After Rangeview, he red-shirted for a season at Mesa State recovering from a broken leg his senior year at Rangeview. After a season in Grand Junction, he transferred to Dodge City Community College. At Dodge, he was the team captain for his freshman and sophomore seasons while earning an All-Conference award his freshman year. After two years at DCCC, he then transferred to Newman University where he finished out his junior and senior seasons and earned a couple All-Academic awards. Coach Love graduated Newman in 2012 with a Bachelors of Science in Criminal Justice and minor in Pre-Law. With aspirations to go to Law School, he decided to take a year off to save up money and began coaching for Liberal High School and fell in love with the job. He was head coach for one of the middle schools and was an assistant for three years at the high school. During his three years there, he won league once with the middle school, a State Championship and State Runner-Up for the high school. He had the privilege to coach several Kansas All-State players during his time. After three years in Liberal, Coach Love got his first college opportunity working as the Assistant coach for Garden City Community College under Charles Long. During his time at Garden City Community College, he helped with fundraisers, camps, recruiting trips and was heavily involved with Residential Life department as a supervisor for the students during the school year. After a year and a half at Garden City Community College, he decided to come back home to Colorado for personal reasons and began to work for a Soccer company called Soccer Stop around January of 2017. 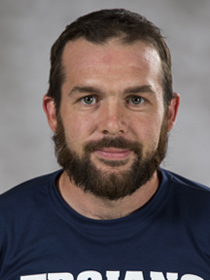 During this past year at Soccer Stop he was coaching youth club ball for Colorado Storm and a short stint for Rocky Mountain before reaching out to Trinidad State with a desire to get involved with collegiate coaching again.